Before the rise of basic cable, Saturday mornings for many children in America were spent watching cartoons on one of three available television channels. From 1958 through the 1980s, a majority of those cartoons bore the Hanna-Barbera imprint. Creating scores of popular series such as The Flintstones, The Jetsons, Jonny Quest, Scooby-Doo, Super Friends, and The Smurfs, Hanna-Barbera was an animation powerhouse. Hanna-Barbera: The Architects of Saturday Morning is the first museum exhibition on the world’s most successful animation partnership. The exhibit provides a glimpse of the extraordinary story of how two astute businessmen reacted to a dying film animation industry and revolutionized a new format for their product, while hiring the best talent in the business, and explores how their product transformed over the years and adapted through government restrictions, corporate changes, and changing viewing habits. 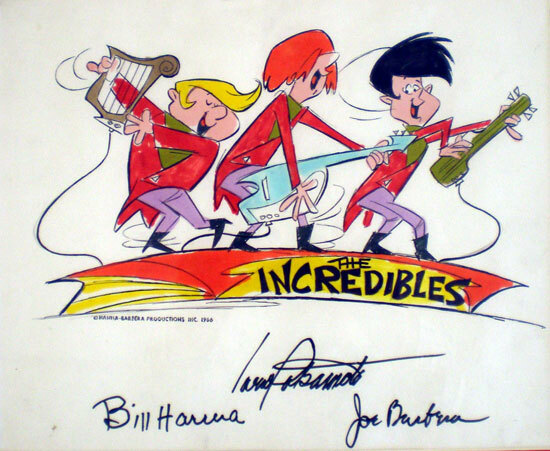 Hanna Barbera: The Architects of Saturday Morning was developed in partnership with Warner Bros. Consumer Products and has been sponsored, in part, by Keator Group, LLC, and the Max & Victoria Dreyfus Foundation. In business together longer than most marriages, two men from very different backgrounds created a company that would come to dominate Saturday morning television. 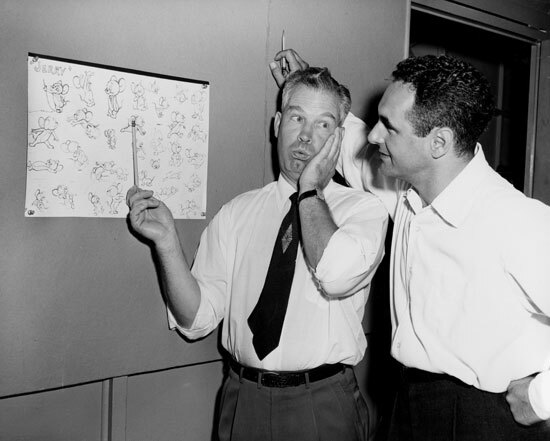 Partners for over 60 years, William Hanna and Joseph Barbera possessed a relationship that would last through the rise and fall of two cartoon studios and the creation of thousands of characters and hundreds of animated and live-action TV shows, films, and specials. In addition to receiving commercial and critical acclaim, their ground-breaking animation work was awarded with 7 Academy Awards (and 8 additional nominations), 8 Emmys, and numerous other awards. 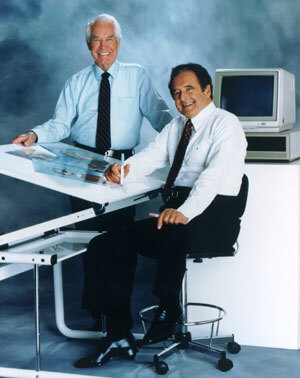 Together, animators Hanna and Barbera created one of the most memorable cartoons in history – Tom and Jerry. 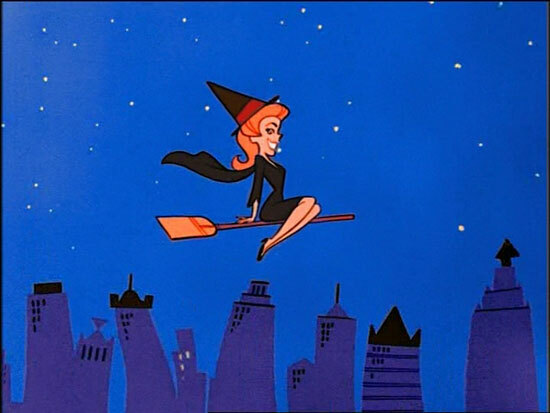 During the rise of television in the 1950s when film studios ceased producing cartoons, Hanna and Barbera saved the field of animation through talent, innovation, and hard work. At a time when General Motors sold 50% of all cars in the U.S., the television program 60 Minutes referred to Hanna-Barbera as “the General Motors of animation,” even though Hanna-Barbera would eventually go even further by producing nearly 2/3 of all Saturday morning cartoons in a single year. Hanna-Barbera Productions was formed in 1957 by Hanna and Barbera, who were very successful animators and producers at MGM Studios. As a result of their work on the Tom and Jerry animated film shorts, MGM received seven Academy Awards for animation – more than Walt Disney himself. Hanna and Barbera left MGM when the studio stopped production on animated films. 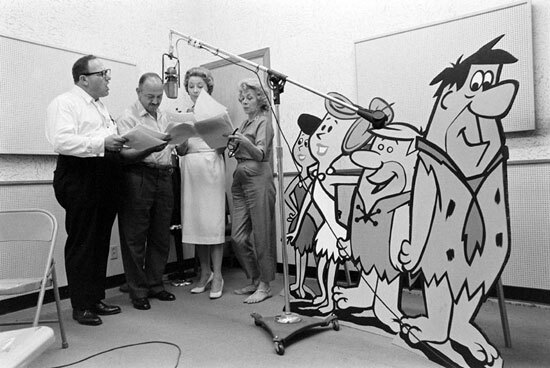 Capitalizing on the changing viewing habits of audiences, the partners achieved immediate success on TV with The Huckleberry Hound Show and Yogi Bear in 1958, followed by the groundbreaking prime-time series, The Flintstones, in 1960. Throughout the next 40 years, Hanna-Barbera produced an astonishing 1,246 hours of original animation in 249 individual cartoon series for television. When Cartoon Network was formed in 1992, Hanna-Barbera supplied most of the programming. Hanna-Barbera was eventually absorbed by Warner Bros., but their animation legacy remains available in syndication and on DVD. The impact of Hanna-Barbera’s cartoons is evident in today’s popular culture, from Fred Flintstone hawking vitamins and Fruity Pebbles cereal to the ongoing creation of new Scooby-Doo television series, comic books, and animated and live-action movies. The exhibition will focus primarily on the “golden years” of Hanna-Barbera, from the premiere of their first television cartoon, The Ruff and Reddy Show, in 1957 and The Huckleberry Hound Show in 1958 to the debut of Scooby-Doo, Where Are You! in 1969. 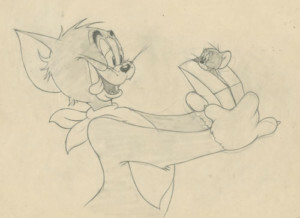 Hanna and Barbera’s early work on Tom and Jerry will be explored, in addition to the scores of TV and film animation and live-action projects created by the studio between 1970 and 2001. 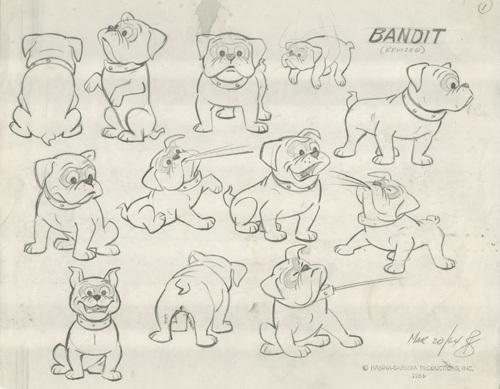 Included within the exhibition will be original animation art, sketches, model sheets, photographs, archival materials, toys and other commercial products, and an interactive installation that will draw from the vast library of characters created by Hanna-Barbera. An exhibition video, produced by Norman Rockwell Museum, will include commentary from veteran Hanna-Barbera animators Tony Benedict, Jerry Eisenberg, Willie Ito, and Bob Singer. 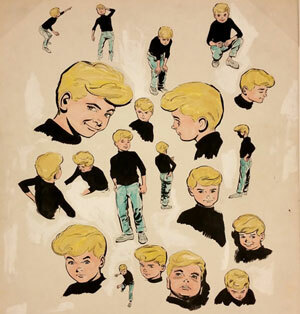 An exhibition catalogue will include a foreword by Jayne Barbera, daughter of studio founder Joe Barbera, and essays by animation historians Jerry Beck and Michael Mallory. Tom and Jerry’s auspicious cinematic debut was in the animated short Puss Gets the Boot (1940). 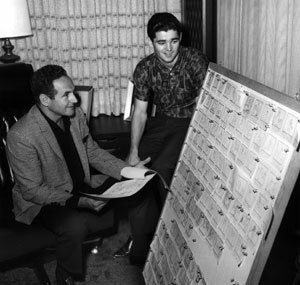 This cartoon provided Barbera a chance to work again with his old friend from New York, Harvey Eisenberg, who created the layouts. Though recognizable as Tom and Jerry, the characters were named Jasper and Jinx in this cartoon. It wasn’t until the second cartoon, The Midnight Snack (1941), that Tom and Jerry received their now-famous monikers. Puss Gets the Boot went on to win an Oscar nomination for Short Subjects, Cartoon, as did their third Tom and Jerry short the following year, The Night Before Christmas (1941). 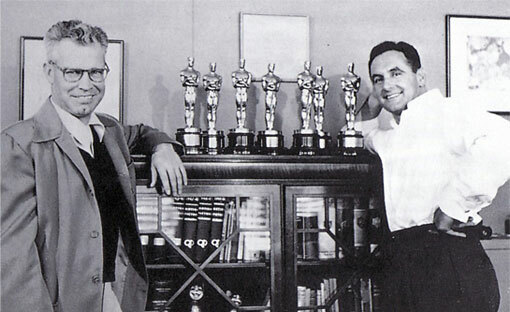 Over the next several years, Hanna and Barbera’s Tom and Jerry shorts went on to win seven Academy Awards and were nominated for an additional six. On the morning of Saturday, August 19, 1950, for the first time in history, children turned on their family television sets to find two shows that were meant just for them. Airing on ABC, Acrobat Ranch was hosted by Uncle Jim and featured circus acts performed by Tumbling Tim and Flying Flo, and Animal Clinic presented live animals with information that was aimed at a younger audience. TV was typically thought to be a family viewing device and it was unusual to see a show intended directly for young viewers. However, since it was determined that adults watched the least amount of television on Saturday mornings, it appeared to be an ideal time to air child-centered programming. As film studios ceased production of animated shorts and theaters had stopped requesting animated shorts for exhibition, television distribution companies began seeking out the studios’ libraries of old cartoons. In November 1955, Paramount sold their library of 1,800 shorts, including Little Lulu and Betty Boop, to a distributor for $3,600,000. The following month, CBS purchased the Terrytoons cartoon library from Paul Terry, Barbera’s old employer, for $5,000,000, which included characters such as Heckle and Jeckle and Mighty Mouse. Using this material, CBS began airing the first Saturday morning cartoon series. The Mighty Mouse Playhouse debuted on CBS in December 1955 and would remain on the air through 1966. Saturday morning shows were often serials, such as The Lone Ranger, The Adventures of Rin Tin Tin, or Sky King, or hosted variety shows that were produced locally. Cartoon shows were almost completely filled with recycled film shorts that were separated by hosted segments. Such was the case with Hanna-Barbera’s first television series, The Ruff and Reddy Show. With episodes running only seven minutes long, starting in December 1957 it was syndicated into markets where it was included in shows with other cartoons that were introduced by a host. 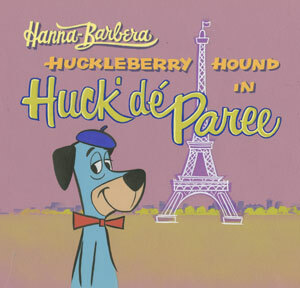 Debuting the following year, The Huckleberry Hound Show became the first half hour animated series to air without a host. From the beginning, Hanna and Barbera possessed the foresight to produce all of their television cartoons in color, even though none of the networks were broadcasting in color and it would be years before the first cartoons were aired in color. 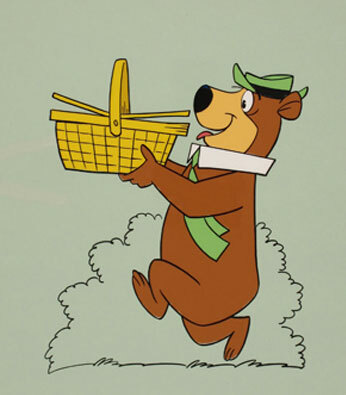 “Joe [Barbera] and I could see color programming looming on the television horizon,” said Hanna. 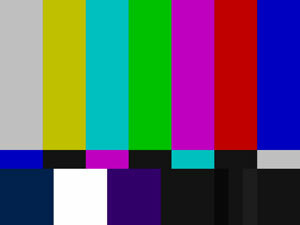 Also, if television didn’t pan out, the color Hanna-Barbera cartoons would be readymade for exhibition in theaters. The debut of The Flintstones in prime-time in September 1960 was received horribly by TV critics. 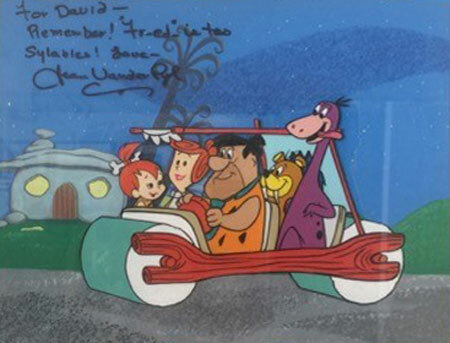 The New York Times referred to The Flintstones as “an inked disaster.” The Baltimore Sun called it “not a very good [comedy] inhabited by unpleasantly uncouth people.” TV critic Jay Fredericks claimed “I was solemnly assured by a local television official a couple of months ago that The Flintstones would be (a) hilarious and (b) THE show of the season. It is neither. The whole series is weak.” Thankfully, audiences disagreed and would follow the stone-age adventures of Fred Flintstone through 167 episodes over the next six years. Fresh off the heels of successful series The Quick Draw McGraw Show and The Huckleberry Hound Show, which not only introduced Yogi Bear to the American public, but also awarded Hanna-Barbera the very first Emmy award for an animated series, Hanna-Barbera was unstoppable. 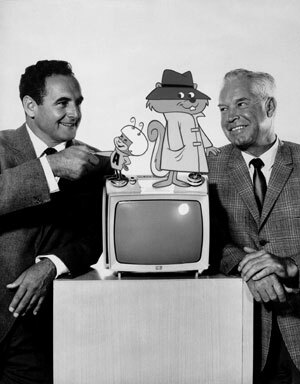 Always with an ear to the ground, William Hanna and Joseph Barbera were cognizant of trends in popular culture. As their audience aged, Hanna and Barbera became aware that many cartoon viewers were becoming interested in the escapades of James Bond on the big screen and the adventures had by Spider-Man, The Fantastic Four, and the Justice League in the pages of comic books. They made a decision to begin transforming much of their Saturday morning fare into the action/adventure genre. William Hanna noted, “…Jonny Quest became one of our most popular shows, and it eventually launched a whole platoon of other Hanna-Barbera cartoon series in the action-adventure genre, including among others The Fantastic Four, Space Ghost, The Herculoids, and The Galaxy Trio.” The first season of Jonny Quest proved to be very popular. 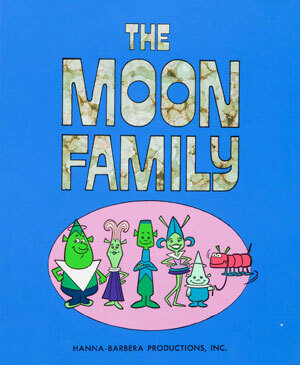 Airing in prime-time, the series’ unique style, superb musical composition by Hanna-Barbera veteran Hoyt Curtin, and inclusion of futuristic technological innovations enamored viewers young and old. 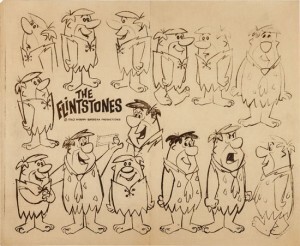 In 1968, CBS executive Fred Silverman, a fan of animation, worked closely with Hanna and Barbera to develop an idea of an animated team of mystery solvers. 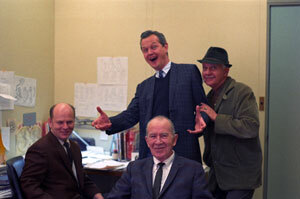 The characters who would become Fred and Shaggy were influenced by Dwayne Hickman’s Dobie Gillis and Bob Denver’s Maynard G. Krebs, characters from the early 1960s CBS series The Many Loves of Dobie Gillis. The recent ABC series, The Mod Squad, which featured a multi-cultural group of hip young detectives, informed the cartoon’s overall look and design. Geoff Jones, Mike Andrews, Kelly Summers, Linda Blake, W.W., and their dog, Too Much, formed the group in Mystery’s Five. With CBS executives wary of the recent outcry against violence on television, they proposed that Hanna-Barbera include some comic relief to lighten the tone of the cartoon. 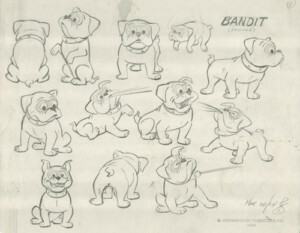 According to Hanna-Barbera’s layout and character designer Bob Singer, Barbera suggested that laughs could be provided by the canine, since Jonny Quest’s pet dog, Bandit, was so popular in the earlier series. Silverman loved the idea so much he decided that the dog should be the star of the show and Barbera assigned Hanna-Barbera veteran Iwao Takamoto to design the animal. The re-crafted series featured the final line-up of Fred, Daphne, Velma, Shaggy, and Scooby-Doo and was christened Who’s S-s-scared! Once again, the network worried that the title might prove too frightening for its target audience. However, once Scooby-Doo’s personality and role within the group were broadened, the network approved the purchase of the re-titled series, Scooby-Doo, Where Are You! 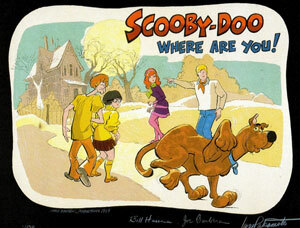 The enormous success of Scooby-Doo, Where Are You! inspired Hanna and Barbera to recycle the idea of mystery-solving meddling kids. 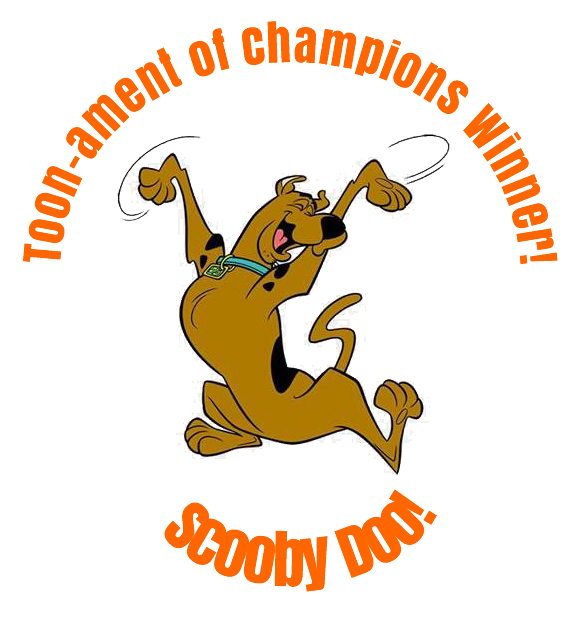 Often using a dog or a similar character device as a comedic sidekick to offset frightening qualities, Hanna-Barbera applied Scooby-Doo’s formula again over the next several years in such animated series as Clue Club, The Funky Phantom, Butch Cassidy and the Sundance Kids, Speed Buggy, Jabberjaw, Captain Caveman, Josie and the Pussycats (the first cartoon with a black female lead), Goober and the Ghost Chasers, The Buford Files, The New Shmoo, and The Amazing Chan and the Chan Clan. Due to pressure from the group Action for Children’s Television in the late 1960s, Hanna-Barbera was forced to address complaints of violence in its cartoons. One successful example of fluffier fare included Hanna-Barbera’s first series to feature live-action segments with cartoons. In a throwback to TV cartoon presentations from the 1950s, Hanna-Barbera began developing a program of animated shorts introduced by hosts, in this case humans in animal suits that were designed by pre-fame producers Sid and Marty Krofft. 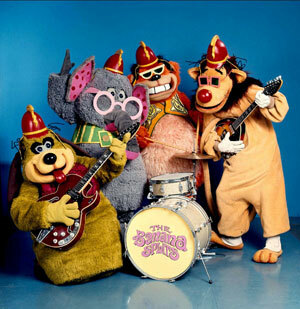 Before the team of Fleegle, Drooper, Bingo, and Snorky were named The Banana Splits, they had gone through several name changes, including Kellogg’s Korny Kritters, Kellogg’s Presents the Hanna-Barbera Happy Hour Starring the What Furr’s, and The Banana Bunch. The Banana Splits Adventure Hour, sponsored by Kellogg’s, debuted on NBC on September 7, 1968 and featured the cartoons Arabian Knights and The Three Musketeers, as well as the live-action serial Danger Island, directed by Richard Donner, who would eventually helm such hit films as Superman: The Movie (1978), The Goonies (1985), and the Lethal Weapon franchise (1987-1998). In 1981 NBC considered eliminating their Saturday morning cartoon schedule, replacing it with a Saturday edition of its weekday morning news show Today. However, one day programming executive Fred Silverman noticed his daughter playing with a Smurfs toy and suggested to Hanna and Barbera that they make a show out of it. Silverman went so far as to tell them that if they could obtain the rights to the Smurfs from its Belgian creator to make their own cartoon series, they would have a guaranteed show on the schedule without the headache of having to go through preparing and delivering a network presentation. Although The Smurfs became an enormous success for the network, and would eventually become Hanna-Barbera’s longest running series, Barbera recalls it wasn’t an easy sell. First of all, he insisted it had to be an hour-long series, in order to allow the unusual characters to develop. This was met with resistance, as was the color of the Smurf’s skin. One executive even suggested the Smurf characters should be a rainbow of assorted colors, instead of all blue skin, though that idea was quickly shot down. Furthermore, one executive at NBC hated The Smurfs so much that Barbera would have to fly to New York every year just to convince NBC’s head of entertainment programming, Brandon Tartikoff, to keep it on the air another year. Hanna-Barbera produced 256 episodes of The Smurfs from 1981 to 1990, until NBC finally decided to phase out Saturday morning cartoons altogether. A major turning point in the history of Hanna-Barbera is marked by the sale of long-time owner Taft Broadcasting to Great American Broadcasting in 1987. According to Iwao Takamoto, once Taft was acquired by Great American Broadcasting, they planned an eventual sell-off of Hanna-Barbera. They wanted to sell as many shows as possible and get them on the air in order to make an eventual sale of Hanna-Barbera more attractive to buyers. This resulted in a sudden increase in output where quantity was preferred over quality. Though Hanna and Barbera still maintained creative control, they were beholden to a new group of shareholders with whom they did not have a history. 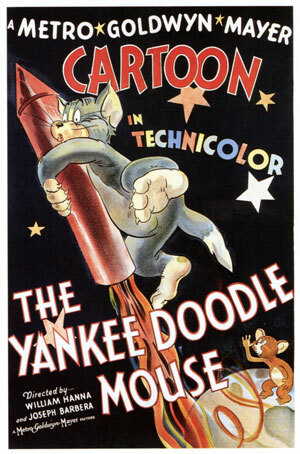 In order to build up their production of cartoons, it was naturally easier to rely on past successes and proven names to sell new cartoons, than place bets on creative teams spending months producing several presentations, of which one or two might prove popular. 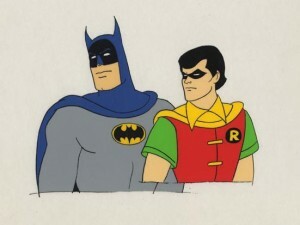 For example, in the period from 1987 to 1993, many of the shows that made it to air featuring recycled characters were A Pup Named Scooby-Doo, The Completely Mental Misadventures of Ed Grimley, Paddington Bear, Bill & Ted’s Excellent Adventures, Tom and Jerry Kids, Yo Yogi!, The Addams Family, and Droopy, Master Detective. Using pre-existing characters may have helped the bottom line and furthered Great American’s sales goal, but it certainly did not produce the type of cartoons that made Hanna-Barbera a beloved institution. Buoying by the success of The Simpsons animated series in primetime, Hanna-Barbera prepared two animated series for premiere during primetime in early 1992. Capitol Critters debuted on ABC on January 31 and Fish Police aired on CBS beginning February 28. Based on Steve Moncuse’s Fish Police comic book series, the cartoon starred sitcom star John Ritter as Inspector Gil who solves crimes in the underwater burg Fish City. Capitol Critters is centered on rodents living in the White House and included political satire that was only able to see the series through seven episodes. Fish Police was cancelled after just three airings. In October 1991 a white knight arrived. Ted Turner desperately wanted a 24 hour cartoon network and was willing to spend $320 million to get it. He purchased Hanna-Barbera’s entire library, along with that of animation studio Ruby-Spears, from Great American, which had been struggling financially. Combined with MGM’s animation library, which Turner purchased in 1986, he now had programming for his network. Cartoon Network was launched on October 1, 1992. With the CW network’s decision to begin airing live-action educational programming during the Saturday morning block, October 4, 2014 marked the first moment in over fifty years without Saturday morning cartoons on broadcast television. Some of the factors involved in the demise of Saturday morning cartoons include political pressure groups like Action for Children’s Television which first dumbed down cartoons in the late 1960s then hastened the move of animation from broadcast TV to cable where programs did not have the same restrictions, the rise of basic cable that began in the late 1970s, the introduction of infomercials and college football which provided cheap programming, and, finally, streaming video. The CW Network, which was the last bastion of Saturday morning ‘toons, today debuts a five-hour package of educational and informational shows. The “Dog Whisperer” is part of it. So are veterinary and outdoor adventure shows. Children craving ‘toons can still get them on cable stations, or on DVDs, or live-streaming video. You tell kids today that Saturday mornings used to be the only time you could find these offerings, they just stare at you. This was when dinosaurs ruled the Earth, and the Earth was in black-and-white. With the decline of animated film production in the mid-1950s, upon forming Hanna Barbera Enterprises in 1957 Hanna and Barbera began recruiting the best writers and artists in the business. Because of mass layoffs in the industry, they were able to hire seasoned veterans like Michael Maltese, Warren Foster, Dan Gordon, Tony Benedict, Art Scott, Willie Ito, Kenneth Muse, Alex Lovy, and Carlo Vinci. Additionally, many Disney employees were laid off after Sleeping Beauty ended production and were now available for work at Hanna-Barbera. 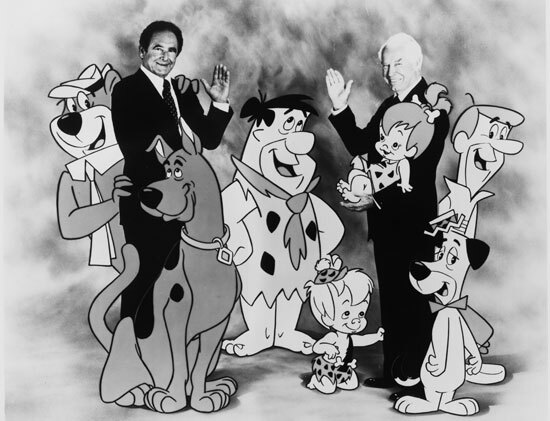 Many of these men are responsible for Hanna-Barbera’s most memorable cartoons, including The Huckleberry Hound Show, The Yogi Bear Show, The Flintstones, The Jetsons, and Quick Draw McGraw. Within the exhibition catalogue will be images of dozens of presentation boards for unproduced series. 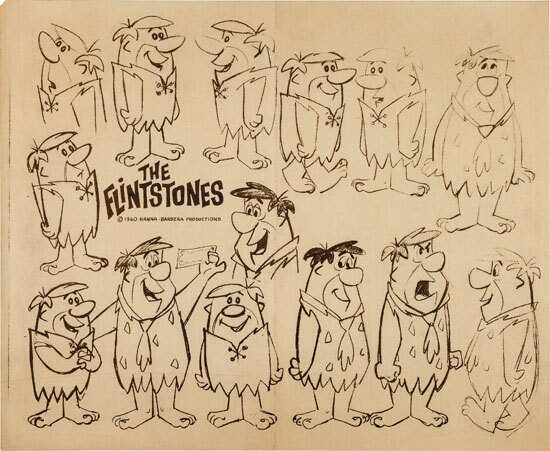 They are just a small sample from more than 300 unrealized projects conceived by Hanna-Barbera from the 1960s through the 1980s that exist in the Hanna-Barbera archives. "Hanna-Barbera: The Architects of Saturday Morning"
Take the Ma ssachusetts Turnpike (I-90) West, getting off at exit 2 – Lee. At the light at the end of the ramp turn left onto Route 20 East and then immediately turn right onto Route 102 West. 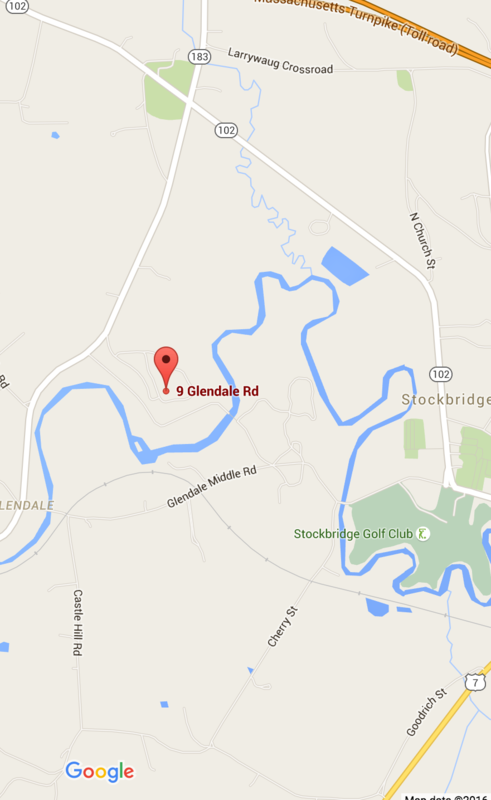 Follow Route 102 West into Stockbridge Center (about five miles). Continue going west on Route 102 (Main St.). Shortly after going through town, you will veer to the right to stay on Route 102 West for approximately 1.8 miles. At the flashing light, make a left onto Route 183 South and the Museum entrance is 0.6 miles down on the left. Go west on Route 102 (Main St.). Shortly after going through town, you will veer to the right to stay on Route 102 West for approximately 1.8 miles. At the flashing light, make a left onto Route 183 South and the Museum entrance is 0.6 miles down on the left.